So… where were we? I’m not really sure, where the last year went, but a lot of client work and traveling made me neglect this space for far too long. Sorry about that! Our latest trip to Athens is responsible for an instant breakfast favourite in our home, and a quick one, too! One of our favourite place in the Monastiraki/Omonoia area was Karamanlidika. Not only was their service especially warm and welcoming, their food (authentic Greek and Middle Eastern cuisine, oftentimes with a twist) didn’t leave anything to wish for, we sampled some cold cuts, a fantastic egg dish with pastirma and sudjuk, an unusual Greek salad with spiny chicory and then some. Anyways, when we returned home, I couldn’t wait to recreate that yogurt dish. My stand-in spice of choice was (half of) a cinnamon stick and I could not have been happier with my substitution! The candied carrots keep well in the fridge for a couple of days and make for a perfect, chilled breakfast snack during these sweltering summer days we currently have! 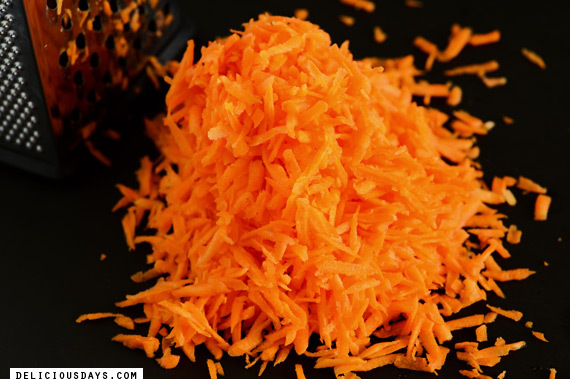 Wash your carrot (peel only if necessary) and grate them rather coarsely. My three carrots weighed almost exactly 200 g after grating. In a small pot combine water, sugar and half a cinnamon stick. Bring to a boil, stirring occasionally until the sugar has dissolved. Add the grated carrots and let cook for about 1 minute, before removing from the heat. Close with a lid and let cool down completely – this will take a couple of hours. 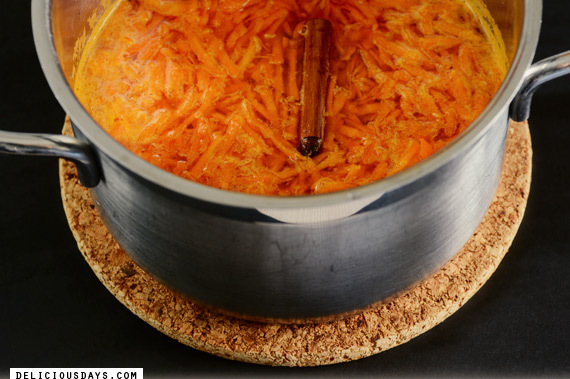 Once cooled down, strain the grated carrots through a fine mash sieve – I won’t press down on the carrots, because I want them to hold some syrup (and do keep the lightly favoured sugar syrup for another use, like sweetening fruit salads etc.). 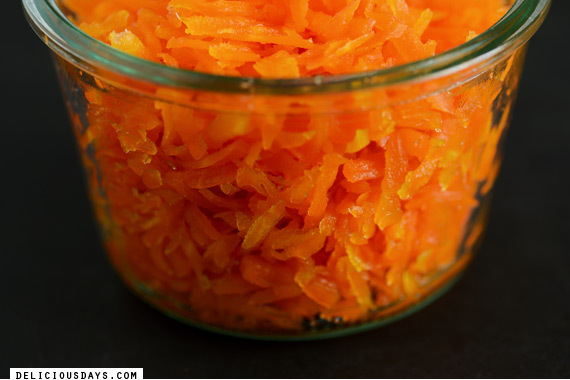 Fill the candied carrots into an airtight container and chill in the fridge. 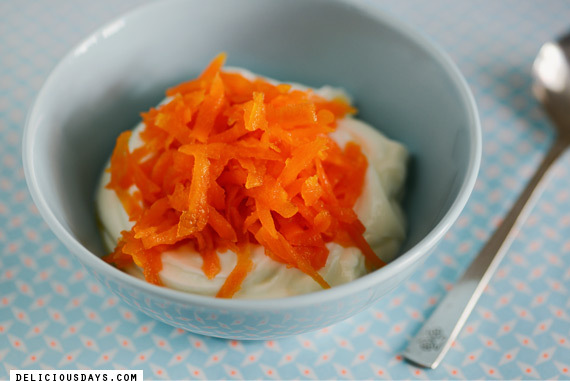 Serve over your favourite Greek yogurt topped with a generously heaped tablespoon of the candied carrots. The carrots keep well in the fridge for a couple of days. Welcome back – you have been missed! So glad you're back! 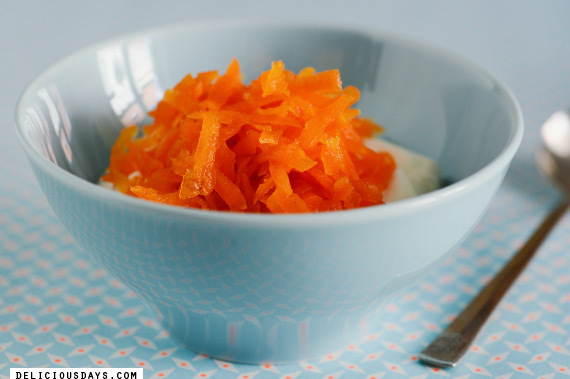 As I'm familiar with Maroccan carrot halva (and love it), this will most certainly be what I will turn our first new carrots of the season into. I'm going to make this tomorrow - I loved getting this as dessert in tavernas in Athens. I wonder if it will be the same without the apple geranium though - maybe that's the key! Very interesting idea! Never thought about using carrots for breakfast.